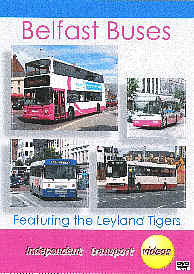 independent transport videos cameras first visited Belfast in 2003 when there were Leyland Leopards and Bristol REs were still around. Now in 2007, the enthusiast will find a very different city. The Leopards and REs are no more, the red and ivory livery of Citybus, an inheritance from Belfast Corporation days, is almost a memory and the two-tone green livery so much in evidence in 2003 is rapidly being replaced by a bright magenta, grey and white scheme. So what could we do but take another trip across the Irish Sea to visit this now bustling city - it's now among the top ten most popular cities in Europe to visit, you know - and see how it's buses have changed in just four years. We start this programme, though, with a look back to 2003, just to let you see what you missed if you didn't get across. In a brief review we look at the remaining REs and Leopards, the dwindling number of Tigers with Gardner engines and the all-pervading low floor single-decker. Now, in 2007, Citybus has been branded Metro, with the new magenta livery, double-deckers are everywhere and the Ulsterbus fleet is also being updated with new vehicles in a blue version of the Metro scheme. We also feature several of the impressive looking new Ayats Bravo 1 double-deckers used on the highly successful Goldline express network. The vehicles of the local CitySightseeing franchisee also feature. With 285 new vehicles on order, the next big casualty will be the fleet of Ulsterbus Leyland Tigers so we have included some of those on routes into the city from nearby towns, as well as rides on two of them. And, with the kind co-operation of our friends at the Irish Transport Trust, there's a bonus feature of a ride out on their preserved Ulsterbus Leyland Tiger No. 343, the condition of which belies its twenty-three and half years. Come with us now and enjoy a visit to this exciting city and the variety of buses and coaches which can be seen and travelled on.